For as long as I can remember I have been fat. For even longer than that, I have hated the fact that I am fat. Only a small part of that has changed. While I'm still a fat woman, I no longer hate the fact that I am fat, nor, in turn, do I hate myself, at least not all of the time, and frankly, that is progress. Today, I would hazard a guess that I am the heaviest I have been in a little while. I don't know the number, because I don't own a scale, and I don't own a scale because I don't weigh myself anymore. Even when I go to the doctor and I'm invited to step up, I always respond the same way: "Oh, that's okay, thanks!" No one has ever challenged me on this, because why would they? I've made it weird enough by not adhering to prescribed way these things go. The reason I don't weigh myself isn't because I am afraid of what I will see when I stand it. It's because I am exhausted from the number that blinks back up at me influencing whether or not I am happy that particular, whether or not I like myself, whether or not I feel like I am allowed to exist in the world. 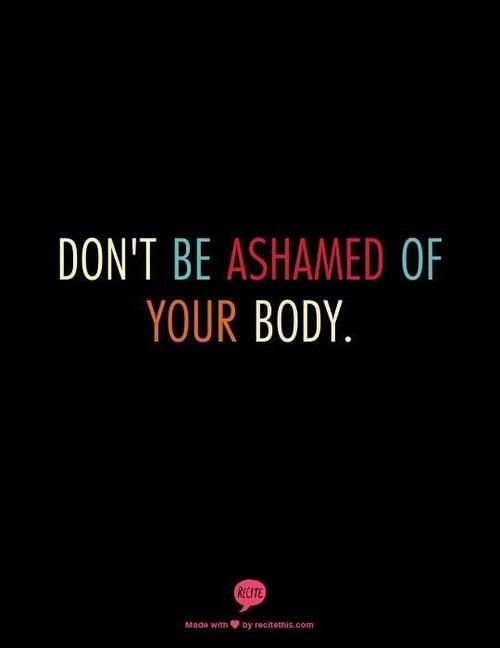 I may not always love my body, but it is mine and it is worth every single bit as any other body out there. I am fat, but I also have my mother's eyes and cheeks and my dad's smile, not to mention the thick waistline of every single Germanic broad in my family who came before me. My body is my house on earth, it is round and soft and strong when it has to be. If my body is all of those things, how could I help but love it unconditionally? But before love can happen, acceptance comes first. So do we get there? In her book Radical Acceptance: The Secret to Happy, Lasting Love, Andrea Miller says this: "Radical acceptance means loving someone fully for who he or she really is — flaws, shortcomings, weaknesses, warts, and all. It signifies loving someone without judgment. It is love filled with empathy and compassion. Radical acceptance is the essence of unconditional love. It creates so much safety that the "love" can truly be him or herself. To radically accept someone means: I know of your flaws, failures, weaknesses, and shortcomings. I still love you." Obviously, in this passage, Miller is talking about the love we feel for a romantic partner, but think about how powerful that approach could be if directed at your own body! After all, no matter how much we love them the person we choose to spend our lives with is something we have CHOSEN. We are born into our bodies, which tends to me that we don't give them a second thought or care. But what if we treated our bodies the way we would the person with whom we chose to enter into a marriage? So I've tried it, and it's worked. Now, instead of berating myself for eating something "junky", I see how it makes my body feel. I listen when my body tells me it needs something, I'm present, accepting, and not willing to turn my back on my body just because it doesn't mean any one of my impossible standards. Radically accepting my body doesn't mean that I'm not open to my body changing. That's what bodies, like the people inside of them, do. My body isn't perfect, but it's mine, and if I can manage to give it even a fraction of the care, attention, and kindness I give the other people in my life, I will call that progress.